When you visit the Market on Kern you can’t miss R. Schletewitz Family Farms. They’re the last ones, or the first depending on which direction you’re entering from, right there at Kern and M. Their rustic wooden boxes showcase the ripe reds, yellows, oranges and purples of all of the best fruits that summer has to offer. And they’re generous with sampling so you know just what kind of juicy, sweet and perfect produce you’ll be taking home to your family. The Schletewitz family has been at this for a long time, starting in 1925 when Carl Schletewitz came to America from Russia. The family has been farming just outside of Sanger ever since, and under the guidance of Carl’s son Ronald they have been selling their produce at the Alemany Farmer’s Market in San Francisco since 1959. I’m a big fan of theirs, I’ve had some of the prettiest yellow plums and most gorgeous peaches. 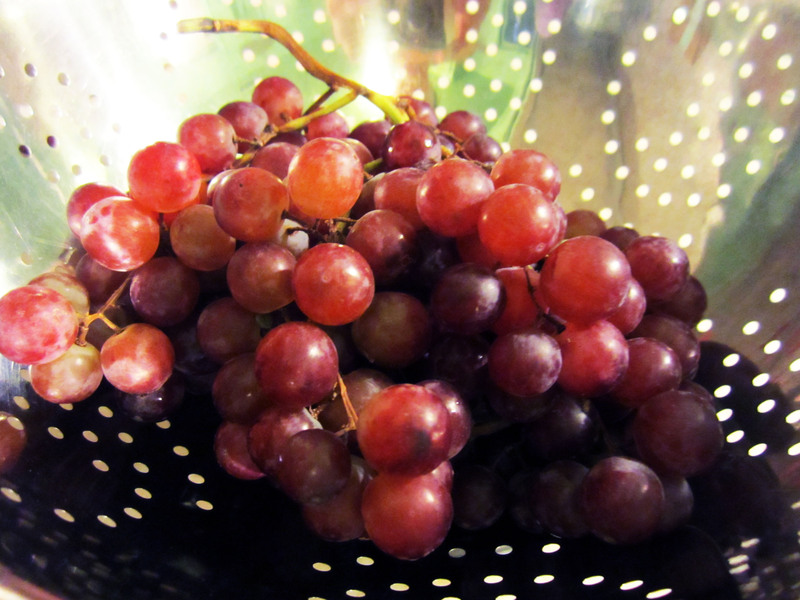 When I was at market last week I spied red grapes and knowing I only had about 6 dollars to my name I bought a little bunch. I don’t wanna brag or nothin’, but I still had cash left for coffee afterward. I was excited, grapes! Nothing makes me feel more like a Fresnan than grapes. My family has had a vineyard for several generations, my great grandmother worked at Sun Maid as a young woman. I’m obsessed in a very unhealthy way with M. Theo Kearney, mysterious and aloof raisin magnate. We like to freeze red grapes and eat them. My daughter swears they’re better than ice cream and I’ll never argue with her on that one. These grapes nearly didn’t make it home. I ran into Leon, one of the homeless I’ve gotten to know a bit. He wasn’t having a good day so I offered him the grapes but he refused them. I tried. And then they sat for a few days- life can be hectic. I looked at them and wanted to do something special with them. Beyond the usual frozen grape snack routine. Being absolutely exhausted and creatively dry I Googled grape recipes. I absolutely didn’t want to make a salad which is what the bulk of my hits were. Then I saw a really intriguing recipe. This was more savory than sweet and looked like it would have a lot of really rich and complex flavors, but also would be easy. I needed easy- it turns out I was coming down with a stupid summer cold. So I present to you a recipe I didn’t make up: Rosemary and Balsamic Roasted Grapes and Olives from Vegetarian Times. For this rustic antipasto dish, you’ll need two shallow baking dishes. One should be large enough (about 2-quart capacity) to use as a serving dish. 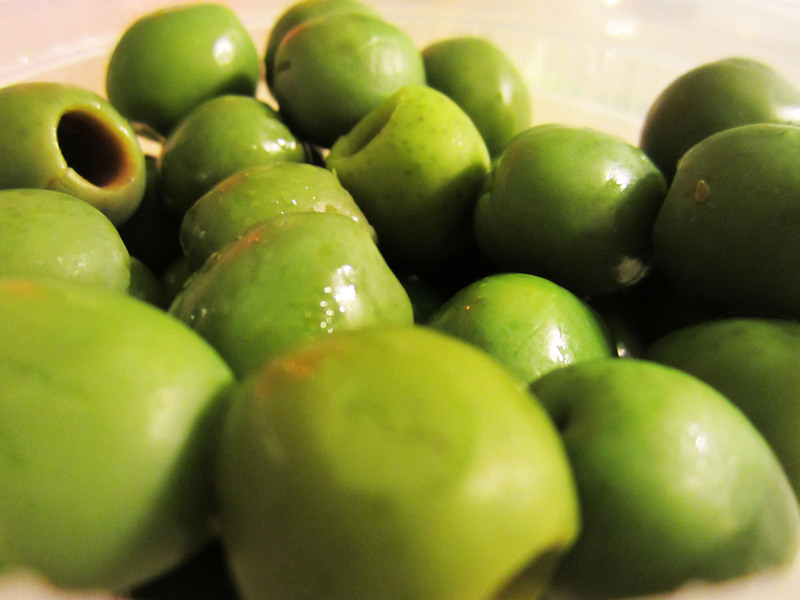 Choose olives that haven’t been marinated or oil-cured. 1. Preheat oven to 350°F. Grease 2 shallow baking dishes with oil. 2. Warm 2½ tsp. oil with 1 tsp. 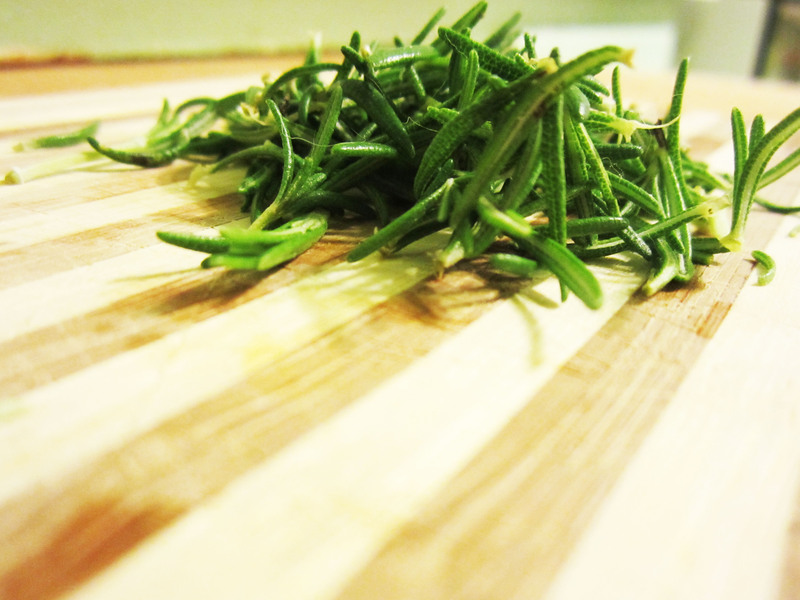 rosemary in skillet over medium-low heat 2 to 3 minutes, stirring occasionally. Remove from heat; stir in walnuts and salt. Spread nuts in 1 prepared baking dish. 3. Whisk together vinegar and agave nectar in bowl. Stir in grapes, olives, and remaining 1½ tsp. rosemary. Spread mixture in remaining baking dish. 4. 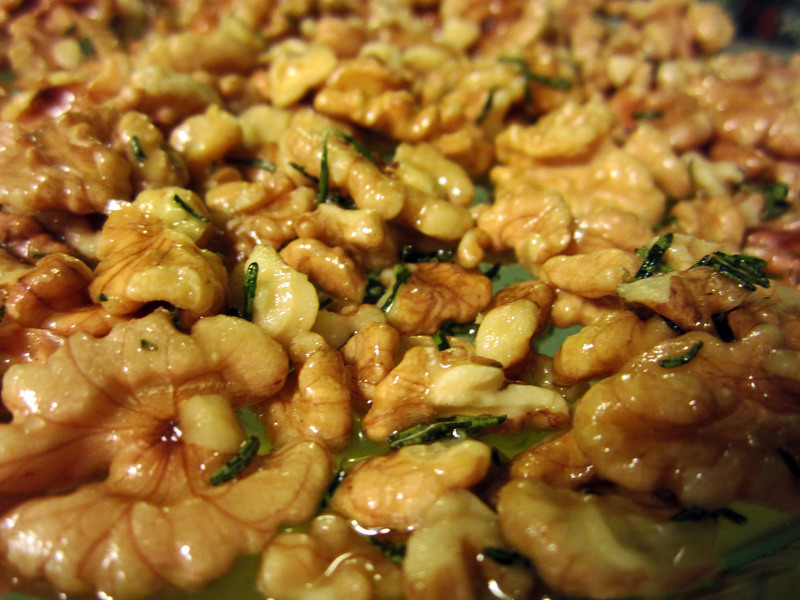 Roast walnuts 9 to 12 minutes in oven, or until golden-brown. Remove, sprinkle with more kosher salt, if desired, and cool. Increase oven heat to 400°F. 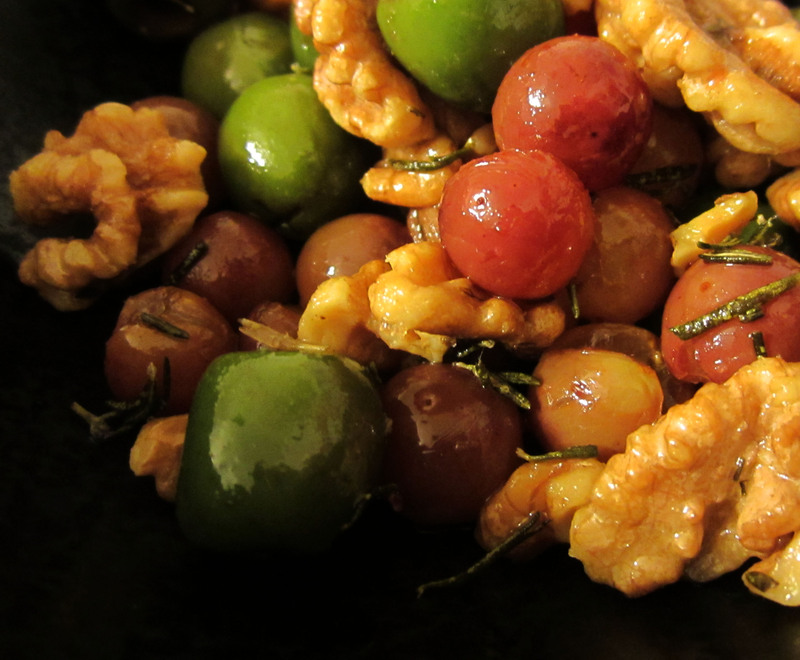 Roast olives and grapes 20 to 25 minutes, or until sauce is syrupy, stirring occasionally. Cool 10 minutes, stirring occasionally. 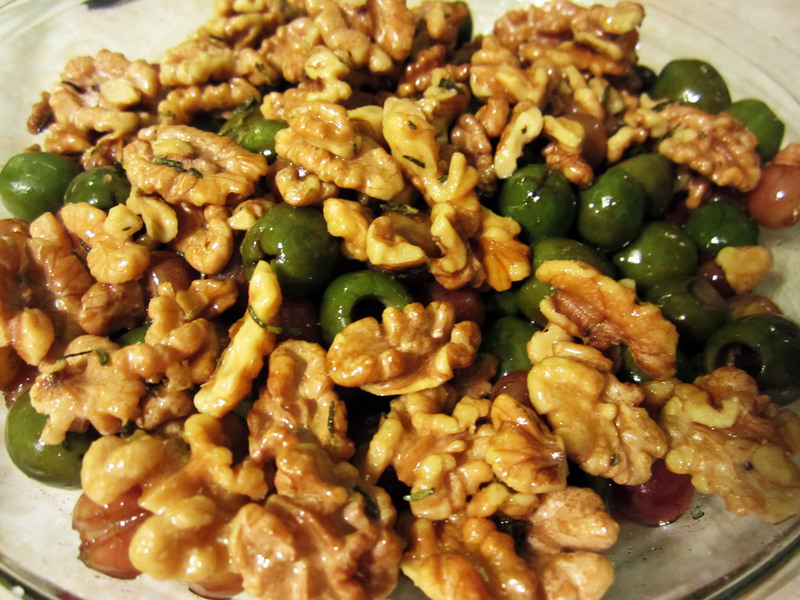 Sprinkle walnut pieces over grapes and olives, and serve warm. That’s it. It’s so good. The sweet and the savory and the salty all merge perfectly. The textures are just right. I used only green olives because I got totally sidetracked at the Whole Foods olive bar and couldn’t see past the delightful chartreuse that I knew would look so perfect next to the ruddy purple of the grapes. And now I’m gonna go retreat to a dark and cozy place with Kleenex and call it a day well spent.